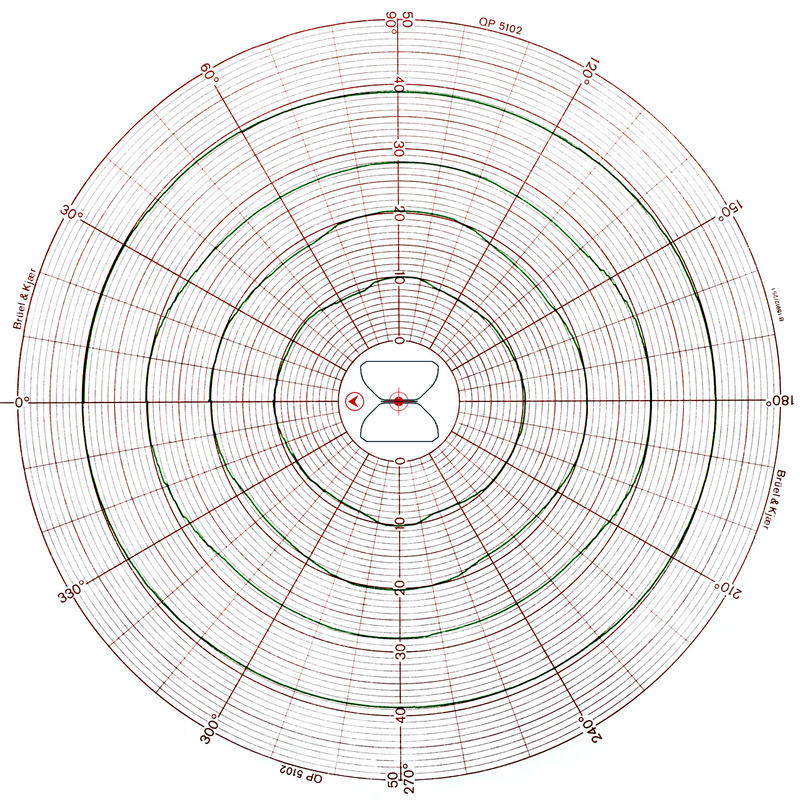 SPHEROVOX MAIN FEATURES 3 PAIRS OF DIPOLES IN MONOPOLE CONFIGURATIONS EVERY LOUDSPEAKER COMPONENT HAS ROTATIONAL SYMETRY ALL LOUDSPEAKER COMPONENTS SHARE THE SAME (VERTICAL) AXIS THE TWO LOUDSPEAKERS IN EACH PAIR ARE AS CLOSELLY MOUNTED ONE TO THE OTHER AS POSSIBLE VIRTUAL POINT SOUND SOURCE SPHERICAL SOUND SOURCE REALIZATION To achieve rotational symmetry, all the loudspeaker components of the spherical sound source have been selected to have by design such symmetry, and are axially mounted, so that they have the vertical rotational symmetry axis as their own axis. To achieve planar symmetry, all axially mounted drivers are grouped in three pairs, whereby each pair point of symmetry lies in the horizontal symmetry plane. Both drivers in each pair are located as close as possible each to the other and operate in monopole mode. Three adjacent drivers - one from each driver pair, have been further enclosed in an own appropriate enclosure and have formed one of two identical half- embodiments, stackable symmetrically on both sides of the symmetry plane. Each of the half- embodiments, placed on a hard board (room floor, ceiling, or wall), is radiating spherically in so obtained half space, exhibiting in this half space the same radiation pattern as if there were two such half-embodiments operating together in full space. 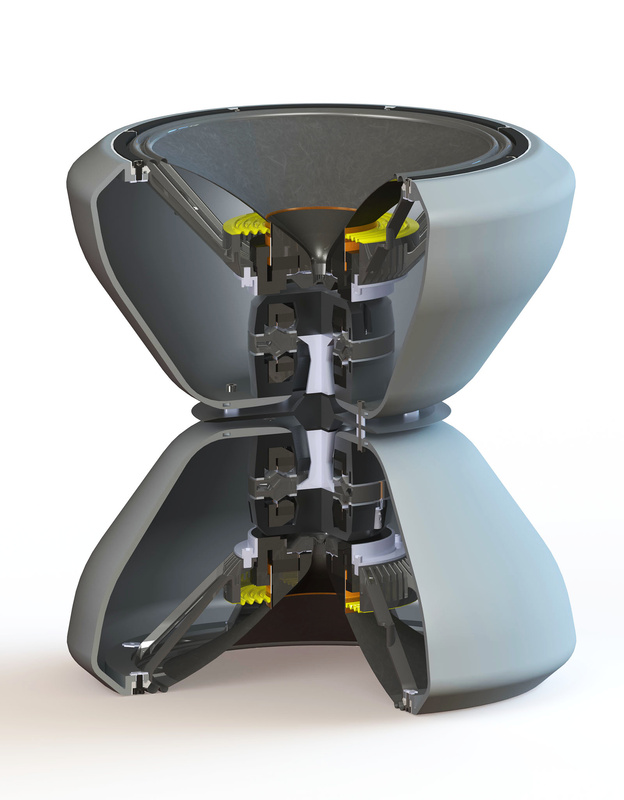 In this way, a spherical sound source made of two identical halves, with the option of stacking them together has been designed. The whole audio spectrum is divided in 3 frequency bands (low, mid-high, and high), every one allocated to one loudspeaker pair, the most external one being the low frequency one. 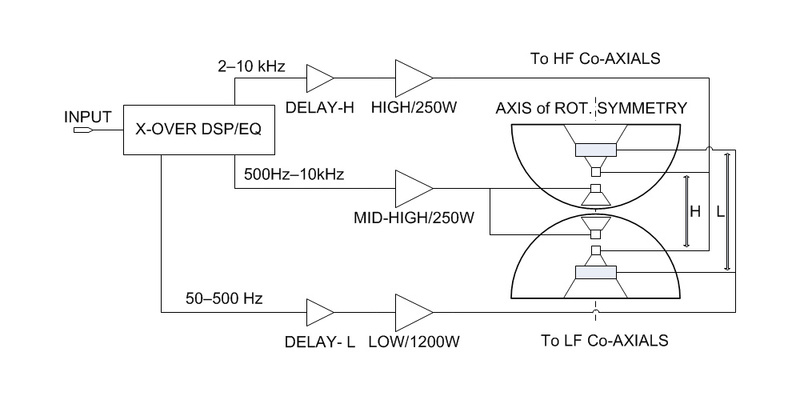 For mid and high frequencies, high sensitivity horn- loaded compression drivers with high power capabilities are utilized. In this way direct radiating loudspeakers are used for low frequencies only, where horn-loading is impractical. 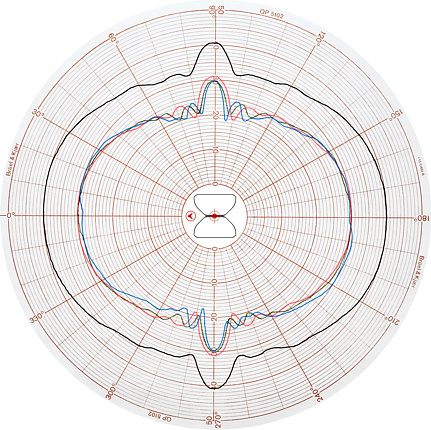 Illustrates the perspective cross-sectional view of the spherical sound source for acoustic measurements. The mid-high frequency compression driver pair, closest to the symmetry plane, has its drivers turned face to face and operated in push-push mode, radiating into a throat of a common radially expanding horn. Two coaxial loudspeakers, containing the other two pairs, are turned back to back facing opposite directions and placed possibly closest to the aforementioned pair. One of them is the pair of the low frequency membrane parts, and the other one is the pair of their high frequency compression drivers. The sound radiating apertures of the latter two pairs are oppositely oriented along the vertical axis. 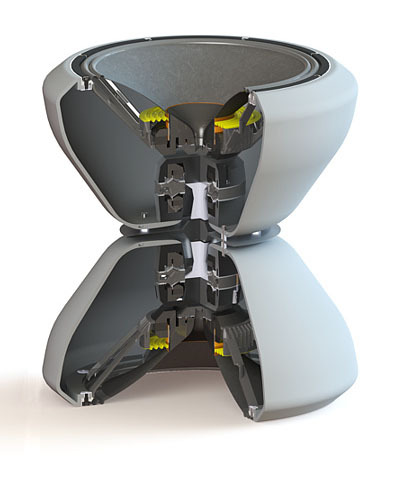 The membrane loudspeakers, fixed on individual closed box enclosures, radiate as if mounted on both ends of a cylinder and have subcardioid individual directivity patterns. Operated parallel in phase, they form together symmetrical spherical radiation diagram for any octave band within the operational frequency range 50 Hz to about 500 Hz. Both high frequency compression drivers of the coaxial loudspeakers radiate in substantially conical space of about 90o – 6 dB radiation angle, defined by membrane cones, which is equivalent to about π/2 solid angle spherical radiation. The 500 Hz to 10 kHz frequency range is radiated by the two large format compression drivers of the second loudspeaker pair, operating into the common radially expanding horn in push-push mode. At frequencies higher than about 2 kHz, however, the directivity pattern of this horn starts resembling a reference ellipsoid. 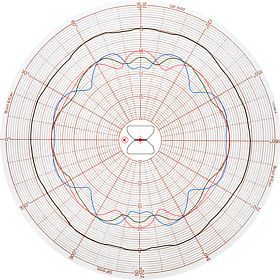 Even though this diagram, due to mid-high compression drivers only, meets the ISO 3382 requirements, a third pair of high frequency compression drivers – those embedded in the co-axial loudspeakers, are added to complete the directivity pattern in both vertical directions to a spherical one. 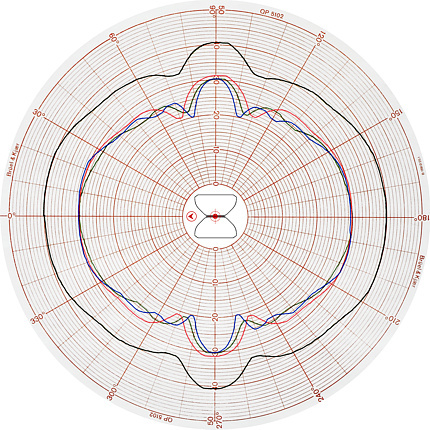 It should be noted that although the activated high frequency coaxial drivers lead to an exclusively smooth octave directivity pattern for 2 kHz and 4 kHz band centered frequencies, small narrower band interferences appeared under their influence on otherwise completely smooth radiation in the range of directions ± 60o vertical angle within the whole 360o horizontal circle. This effect somewhat compromises the frequency response flatness by causing irregularities of the otherwise perfectly radiating mid-high frequency pair alone. Hence, some acoustic measurements might be more precise with coaxial high frequency drivers switched off, which would result in very precise (with very flat frequency response) first and second order reflections from the most relevant mid areas of all reflecting walls of the measurement room. Spherical sound source signal flow and processing. 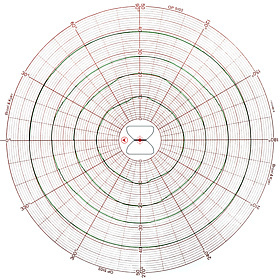 Due to the achieved symmetry, the designed sound source is characterized by fully symmetric 3- D directivity diagram, which could be precisely represented by a quarter of a single vertical polar pattern. If measured digitally, this means only about 18 discrete measurements in 5° vertical resolution, or about 36 measurements in 2.5° - resolution. A schematic diagram is showing signal flow and signal processing electronics. Low frequency drivers are powered by 1200W/4Ohms amplifier, while mid-high, and high frequency compression drivers are powered by 250W/4Ohms, all being class D B&O - IcePower amplifiers. 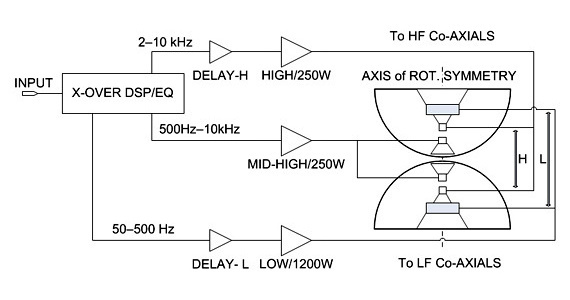 Crossover slopes are 24dB/oct, and crossover filter types are Linkwitz-Relay, but might be any other type. No intricate EQ-ing was applied except for 30Hz LF-cut-off with 6-dB peaking at 60Hz. EXPERIMENTAL MEASUREMENTS To obtain directivity characteristics of the spherical sound source, polar patterns were recorded by B&K recorder Type 2305 using turn-table B&K Type 3921. The measurements were made in semi-anechoic chamber (i.e. dead room with hard reflecting floor). Floor installed microphone B&K 4133 was used at a distance of about 2m from the source center, which is on the inclined rotational table axis. The measuring signal was 1/3 of octave filtered pink noise equivalent signal, obtained by frequency modulation of sine-wave signal within each 1/3 frequency band, suggested by Dr. Benjamin Bernfeld and published on CD under Pierre Verany label in 1984. A full octave filtered pink noise equivalent signal was produced by summing three adjacent 1/3 frequency modulated sine-wave signals within each individual octave. The relative comparative measurements were carried out to compare the difference and accuracies between real 1/3 and 1/1 filtered pink noise signals and their frequency modulated equivalents. 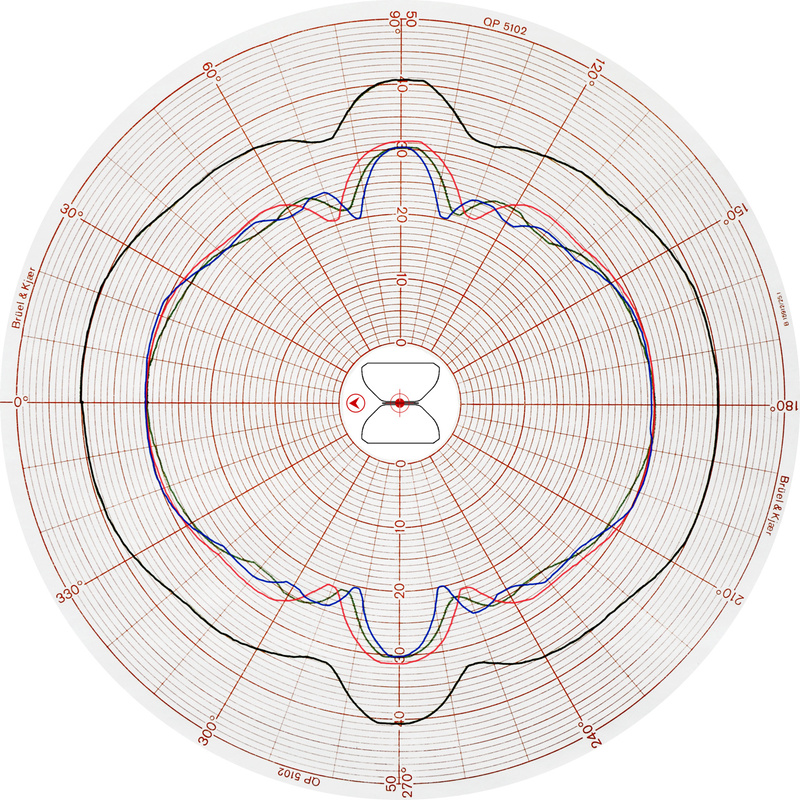 Frequency modulated 1/3 and 1/1 octave signals turned out to be much more precise and perfectly repeatable, due to their very fast averaging time as deterministic signals, thus ensuring precise angular resolution at the normal turntable rotation speed. These signals would excite any room mode available within the modulation frequency band and would have acoustical properties of the random filtered pink noise signal, with the convenience to be measured much faster and more accurate, which is very important for polar measurements, where turn-table speed of rotation creates errors, increasingly with lowering the frequency. 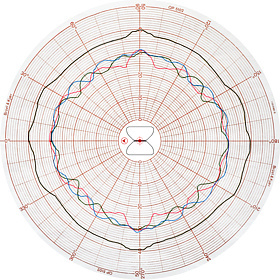 Vertical polar patterns were measured for each octave and 1/3 octave center frequency. 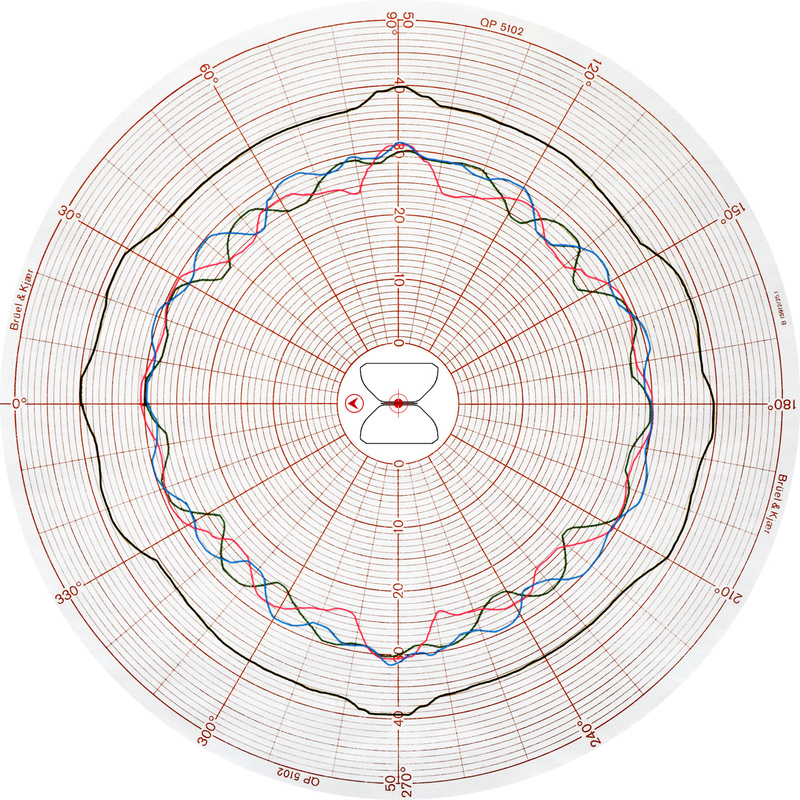 Results are shown for 125Hz, 250Hz, 500Hz and 1kHz octaves. Additionally, for 2 kHz and 4 kHz octaves, graphs with included 1/3 octave center frequencies are shown. 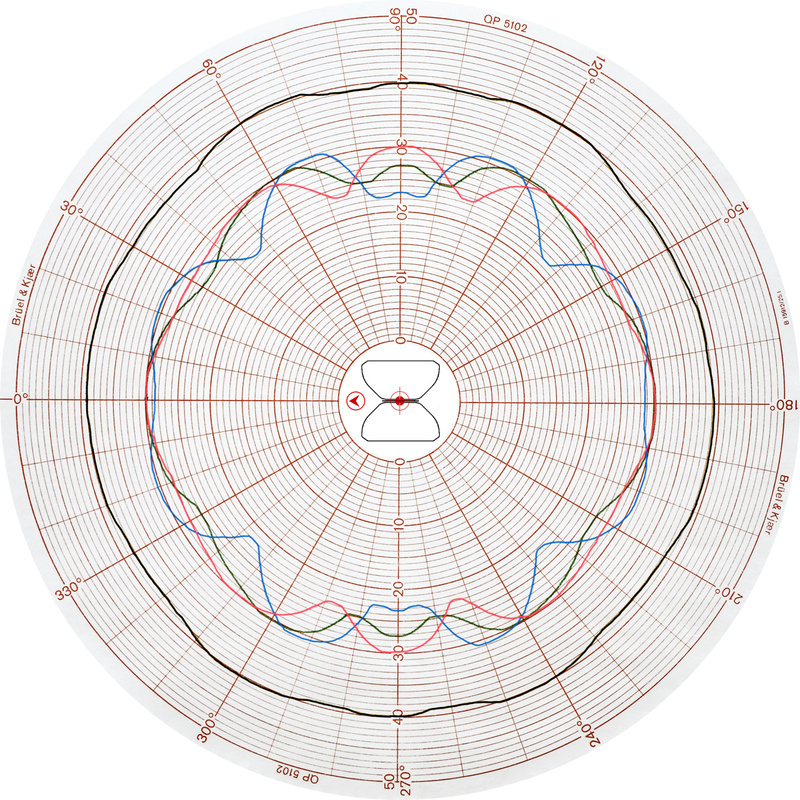 Polar response of the Spherovox to 125 Hz (outermost curve), 250Hz, 500Hz and 1kHz (innermost) octave band excitation signal. Polar pattern of the spherical sound source to 2 kHz octave band excitation signal along with one-third octave bands within (1.6kHz - red, 2kHz - green, 2.5kHz - blue). Polar pattern of the spherical sound source to 4 kHz octave band excitation signal along with one-third octave bands within (3.15 kHz - red, 4 kHz - green, 5 kHz - blue). The graphs of the same measurements are shown, however with high frequency coaxial compression drivers switched off. Polar pattern of the spherical sound source to 2 kHz octave band excitation signal along with one-third octave bands within; high frequencies compression drivers switched off. Polar pattern of the spherical sound source to 4 kHz octave band excitation signal along with one-third octave bands within; high frequencies compression drivers switched off. From measured and represented polar patterns, rotational and planar symmetry of the Spherovox is obvious. It should be pointed out that any vertical polar pattern shown is perfectly identical to any arbitrarily selected vertical pattern, thus giving all data needed to construct the full 3D balloon diagram for a single frequency band. It must be mentioned, that these vertical patterns are actually the worst case patterns of the spherical sound source. 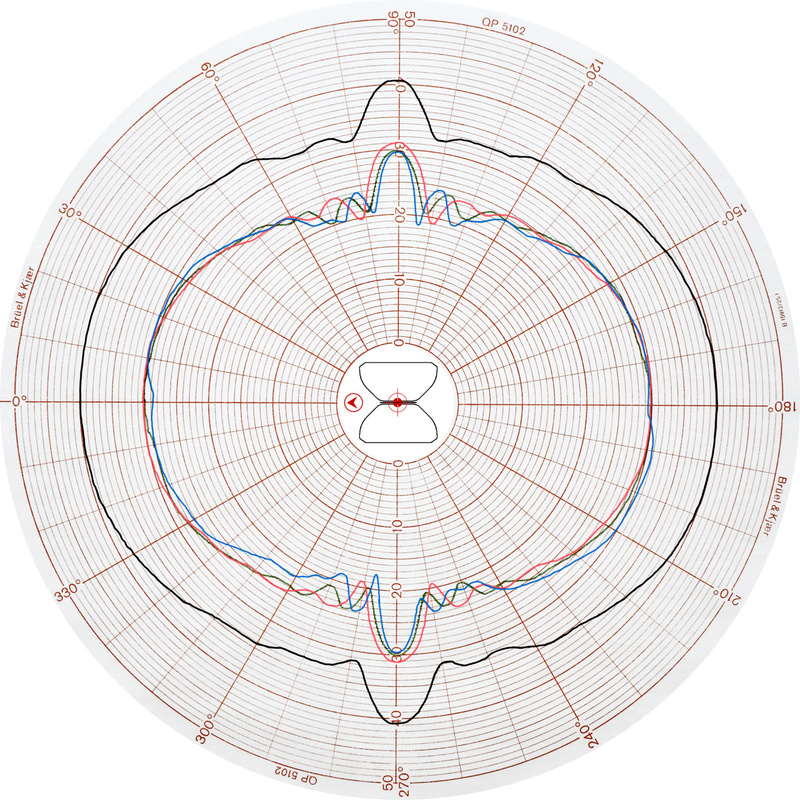 Any horizontal rotational polar pattern with a microphone shifted over an arc within a vertical angle of ± 60o or so would be a perfect circle, not only for 1/1, and 1/3 octave band filtered signals, but with pure sine wave signal at any frequency within the operating frequency band 50Hz – 10kHz. Directivity patterns with pure sine wave signal, however, should be measured under real free field conditions, i.e. either into a very big and highly damped anechoic chamber with sub 100Hz critical frequency, or outside, using ground plane measuring technique.